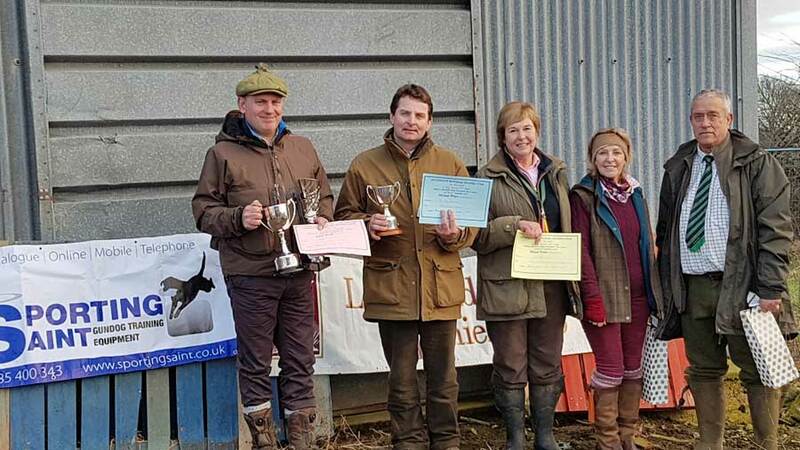 Leconfield Working Spaniel Club Novice AV Spaniel Stake Held on 30th January 2018 at the Riverhill Shoot.West Sussex. Kind permission of Louie Robertson and Darron Stockley (Keeper) and their wonderful team. 1st Prize The Egremont Cup, Sporting Saint Vouchers & The Chris Parsons Memorial Trophy for the Best Retrieve, with some more Sporting Saint Vouchers. 2nd and The Lavery Glass plus Sporting Saint Vouchers. Also Guns Choice. 3rd Balisla Buckleberry of Briffoaks - June Bearman. ​Weather was great, atmosphere lovely and a big thank you to all the helpers. Wonderful spaniel ground, all dogs performed and hunted well with some excellent flushes and retrieves. Great Guns too. Thank you.